For an internal combustion engine to operate properly, it must exhibit exact, mechanical engine timing. More specifically, the crankshafts and camshafts must rotate in concert with one another. In order to ensure proper timing, a belt or chain connects the crankshaft with the camshafts. A timing cover usually houses the timing belt/chain in order to protect it from outside elements and conditions. Most timing belts are manufactured with high temperature neoprene or highly saturated nitrile with teeth made of fiberglass cordline. Although these materials are quite durable, time, temperature, and use will degrade the belt. Once a belt begins cracking, it is only a matter of time before the belt breaks; if this happens, an engine could be irreparably damaged. In 2005, Audi instituted a gradual switch from belts to chains. Although heavier and a bit louder than belts, chains are more durable. Whereas most technicians suggest you replace your timing belt every 75,000 miles or five years, most timing chains will last the entire life of a vehicle, outliving the engine itself. 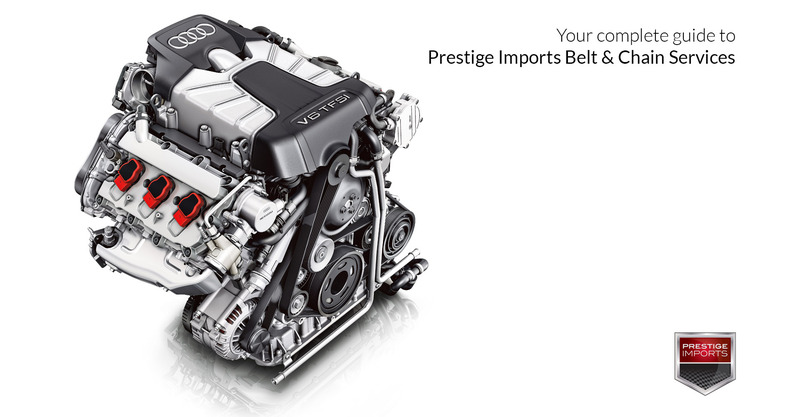 To find out if your model and year of your Audi uses a belt or chain, contact a Prestige Imports certified Audi technician. All Porsche vehicles use timing chains. While some timing belts, depending on the material from which they are constructed, can last up to 160,000 miles, there are no guarantees when its comes to longevity. To this end, you’ll want to be aware of some telltale signs that your belt needs to be replaced. Three of the most evident symptoms are: your engine revs between 2000 and 4000 RPMs while driving, difficulty starting or running your vehicle, and your exhaust expels more smoke than normal. Both the serpentine belt and v-belts keep the alternator, power steering pump, and the air conditioner running properly, but do so through slightly different means. One finds v-belts, traditionally, in older vehicles. This is due to the fact that manufactures used separate belts for different functions. As mechanical knowledge and technology improved, designers created the serpentine belt. The serpentine belts is one long, continuous belt that controls the various functions which formerly had been separate. Most Audi vehicles switched from v-belts to a single serpentine belt in 1992. Serpentine belts are v-ribbed along one side and thinner than a timing belt. The ribbed side of the belt interlaces with the grooves on the accessory drive pulleys; the flat side of the belt slides across tensioner rollers. The serpentine belt’s shape allows it to bend easier; likewise, it is more flexible so as to wrap around the various accessories inside the engine. If you hear a squealing noise emanating from underneath your hood, that’s a sure sign that your serpentine belt needs to be changed. If you visually inspect the belt, look for missing ribs on its inner side, as well as general fraying. Typically, though, manufacturers suggest you change your serpentine belt every 150,000 miles. Belt tensioners are pulleys that provide constant and correct tension on the serpentine belt so that it performs properly. Likewise, they prevent other components from undue stress and failure. Whenever you replace your serpentine belt, your belt tensioners should also be replaced. Typically, though, manufacturers suggest swapping out your tensioners every 60,000 miles or five years. A visual inspection of your belt tensioners should also provide you with warning signs as to whether or not a replacement is necessary. These signs include: rust or cracks on the tensioners’ face, as well as wear on the pulley or its bearings. Likewise, if the a rattling or squealing noise emanates from the tensioners, you should consider replacing them. To schedule a Porsche or Audi Belt Service, inspection, or replacement package contact Prestige Imports Parts and Service Department at (303)446-4994.